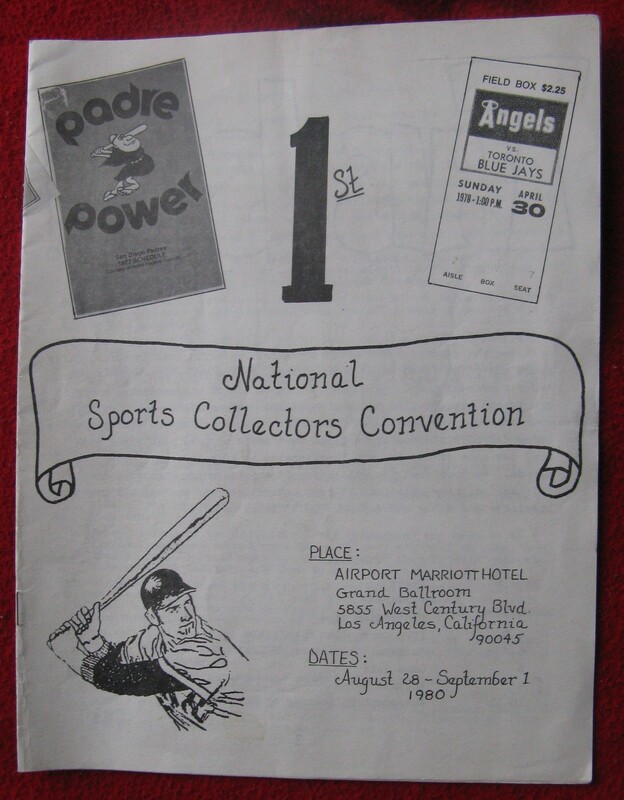 The National Sports Collectors Convention will celebrate it’s 40th anniversary this year. 40 years is a long time. 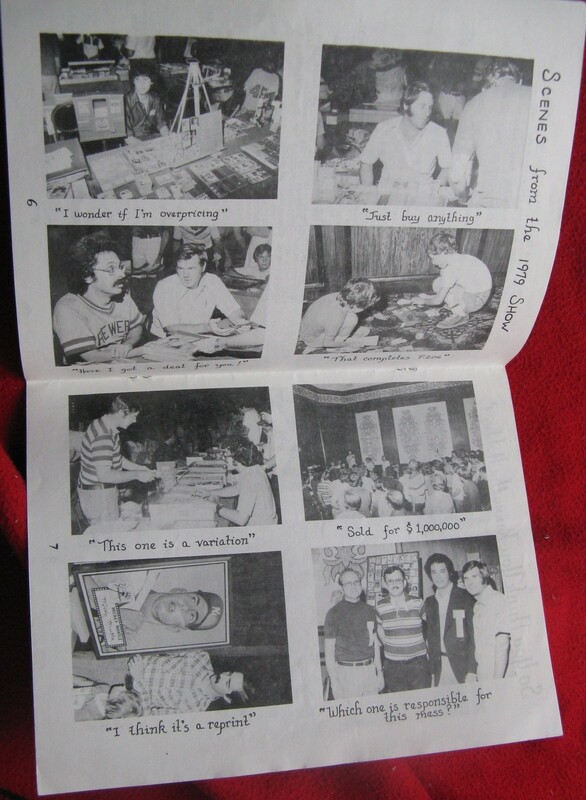 Just think about how many autograph guests, memorabilia, and cards have made their way through each show. I’ll give you a hint. Its a lot. Every collector should experience at least one National in their lifetime. Its the greatest show in the world. I’ve attended seven of them starting in 2007. Its an awesome opportunity to meet-up with industry insiders, get some autographs, and pull incredible cards. Many of my big pulls have come at the National. Lots of luck floating around. Anything can happen. In 2019, the National takes place 7/31-8/4 at the Donald E. Stephens Convention Center in Rosemont (Chicago), IL. Tickets are now on sale. General Admission and various VIP packages are available. I highly recommend purchasing one of the VIP packages. Each comes with a ton of free stuff. TRISTAR will announce the autograph lineup in the coming months. 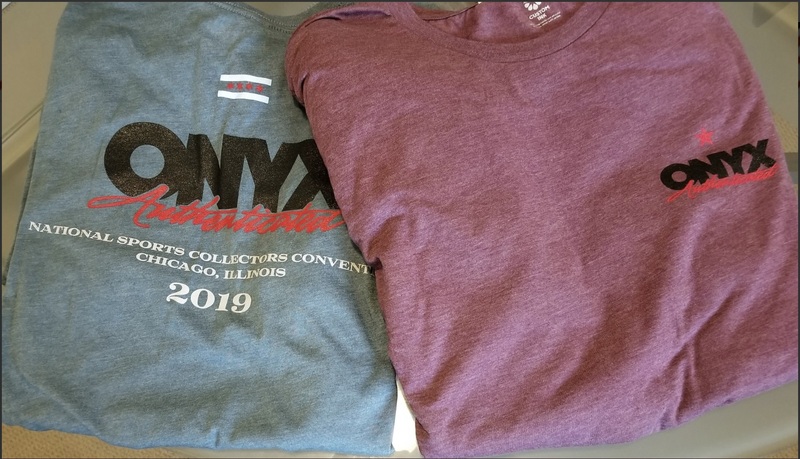 Onyx Authenticated will be in Chicago, and they’ve got shirts all ready to go. BIG PULLS!!! Only at the National. Advanced tickets to the 34th National Sports Collectors Convention are now on sale. This year’s National takes place at the Donald E. Stephens Convention Center in Chicago. The National is one of the greatest places for collectors to gather, show off their collections, get autographs, and pick-up an endless amount of promos. If you can’t find it at the National, it most likely doesn’t exist. TRISTAR has already scheduled a bunch of athletes to sign autographs with plenty more to come. In a few months we’ll start hearing what Topps, Upper Deck, Panini, and all the other major players have in store for collectors. Lots of great memories can be made while attending The National. You never know what might happen or who you’ll meet. Now this is a blast from the past. 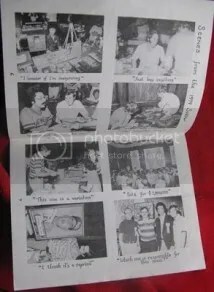 Check out this program from the very first National back in 1980. I think we’ve come a long way since the Airport Marriott Hotel in Los Angeles. Someone snagged this program up recently for $60.00. 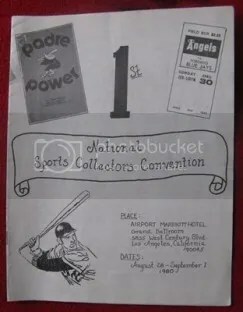 Tickets for this year’s National Sports Collectors Convention are now on sale. As usual you have your general admission, VIP Package, and/or SuperVIP Package to choose from. This year’s convention takes place on August 1-5 at the Baltimore Convention Center. Right now its early, and they only have three VIP signers – Mike Hargrove, Dexter Manley, and Joe Washington, but many more will be added. No word yet on what will be included within the VIP packages either, but that will soon come. The promos are the best thing about the NSCC. Plus you have the opportunity to meet some great athletes. 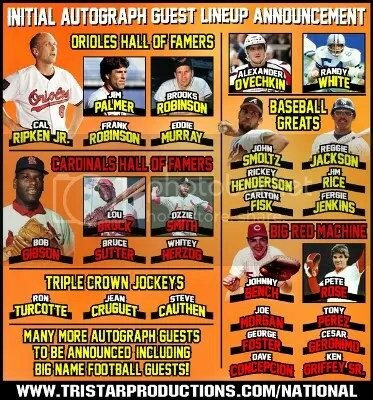 In addition to the list above, Bob Griese, Rod Carew, Ralph Kiner, Steve Carlton, Gordie Howe, Jim Bunning, Billy Williams, Goose Gossage, Phil Niekro, Fergie Jenkins, and Earl Weaver are scheduled to come. 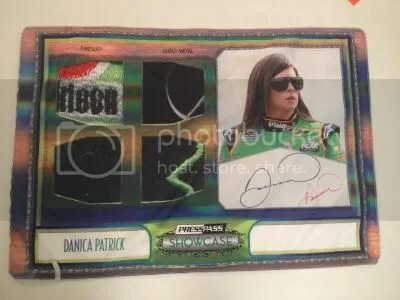 Press Pass will be giving away this Danica Patrick autographed banner at their booth too. More info on manufacturer’s promos and wrapper redemption programs coming soon! Its never to early for National news!!! When you think of this year’s Score Hockey, big pulls aren’t the first thing that come to mind. The chances of pulling anything big from a $0.99 pack are so small its not even funny. But thats not what 2010-2011 Score Hockey is about. Its mostly for new/set collectors. But that didn’t stop Panini from sprinkling in a few high-dollar recollection autographs that are extremely rare. 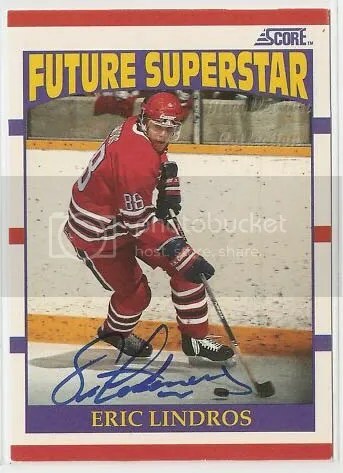 Take a look at this Eric Lindros Recollection autograph limited to only 5 copies. It just sold for over $2,000.00. Thats totally insane! Not too bad for a $0.99 pack. I wonder what a Gretzky ’79-’80 O-Pee-Chee Recollection autograph would sell for? This has to be one of the most disturbing trends I’ve found. Individuals are now selling COA’s that are from or look like they are from reputable companies. 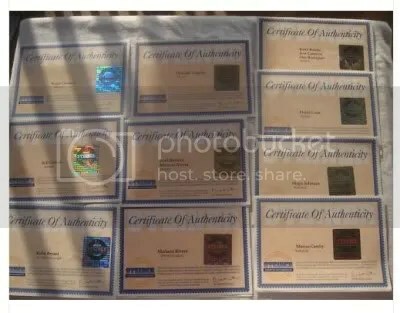 All a forger would have to do is purchase a few of these COA’s that look like they are from Steiner and then forge the autograph. Each of these COA’s comes with a hologram containing the Steiner logo. I’m wondering what happened to the actual items these COA’s belong to – if they existed at all. Forgers could do this for all reputable authenticators within The Hobby. 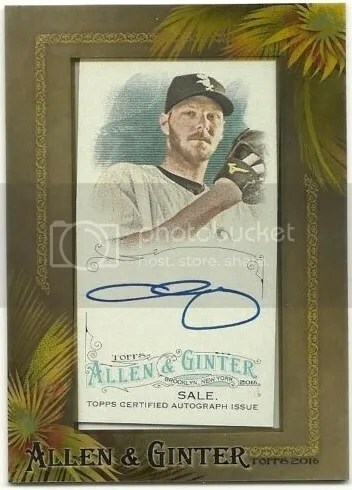 A good portion of the time COA’s from companies like Steiner will contain serial numbers that match a hologram placed on the item. All it would take is for some uneducated collector not to realize the serial numbers don’t match. For many, they just see the Steiner name and that would be enough. COA’s for autographed items is just one area forgers will use these things. They could also be used for rare cards that could be purchased directly from the manufacturer such as blank backs, proofs, etc. I don’t think eBay should allow sellers just to sell COA’s in an auction. Why in the hell would someone want to purchase one if there isn’t an item to go with it. The whole situation is setup to cater towards a counterfeiter. Of coarse eBay won’t stop them because they want their fees. Collectors have to be so careful when purchasing an autographed piece of memorabilia. My personal favorite authenticator in The Hobby is Mounted Memories. I have a Dan Marino autographed photo that contains a COA from them. If you visit Marino’s official website, everything he has autographed comes with a COA from Mounted Memories. At one time, Marino was on the Board of Mounted Memories too. Nothing can ever be as good as meeting the athlete in person. 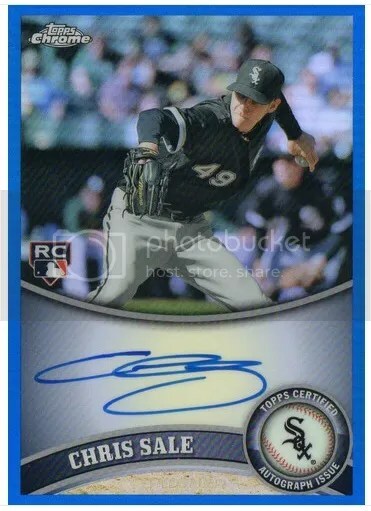 Sure it may cost a bit more, but you can be 100% sure the autograph you received is real. Remember, if its too good to be true, it probably is.